Ever since I was about 15 I had this dream of flying. I loved everything and anything with altitude. The higher I was, the better. As a kid I would always climb on roof of the house and look over the other houses to get a better view. I wanted to make flying my profession so upon leaving school, I drove to Moorabbin airport to investigate flight schools. In my investigations, I learned that you needed at least 1000 hours flying time before any commercial airline would accept you into their programme. Flying for Qantas would have been a dream come true. However my dreams were soon crushed when I found out to obtain a commercial pilots licence would cost in excess of $20,000 and to gain 1000 hours flight time meant trying to find a job in the aviation industry and as a rookie is not easy. I was told that the best way to gain hours quickly was to move to remote areas of Australia where flying is the main source of transport. Not only was $20,000 an extreme amount of money back in those days (1990), my parents were not wealthy and I had just left school, so the thought of moving so far away from home was daunting. So my dream was crushed and my studies then lead me into Engineering as a metal fabricator. The money was good and this is where I have stayed until today. I still had a love for flying and found myself taking Joy flights where ever I could. I did an acrobatics flight in a Pit Special over Queenstown in New Zealand. I also went Heli-skiing whilst in New Zealand. I got to fly to the first ever Australian Grand Prix held at Albert Park in a Bell 206 Helicopter. I was also lucky enough to have many helicopter flights as my wife’s father worked at Jayrow Helicopters as the chief engineer. I also did a flight in a DC3 over to King Island just to go there for lunch. Something to do on a Sunday afternoon. These are just some of the many times I took to the sky, unfortunately it was with someone else at the controls. Then in September 2016 a good friend of mine Rick and I were talking about our exploits of flying and our love to actually fly. Many years ago Rick mentioned to me he was taking flying lessons to obtain his Private Pilots Licence, but recently was looking into powered parachutes. He showed me some videos. “Now that looks awesome” I said. Rick owns a large property out the back of Tarneit, west of Melbourne and his recent investigations led him to Aerochute Industries. Rick and I both thoroughly investigated the safety of powered parachutes and found by all accounts claimed to be one of the safest forms of flying in the world. So it was decided this is what we want to do to finally fulfil a dream and a phone call was made to Stephen Conte from Aerochute Industries. Stephen is the founder and Chief Flight Instructor for Aerochute industries and talked to us about all aspects of flying his Aerochutes. It all sounded so perfect, so a booking was made to do an Introductory flight in November 2016 with Stephen. 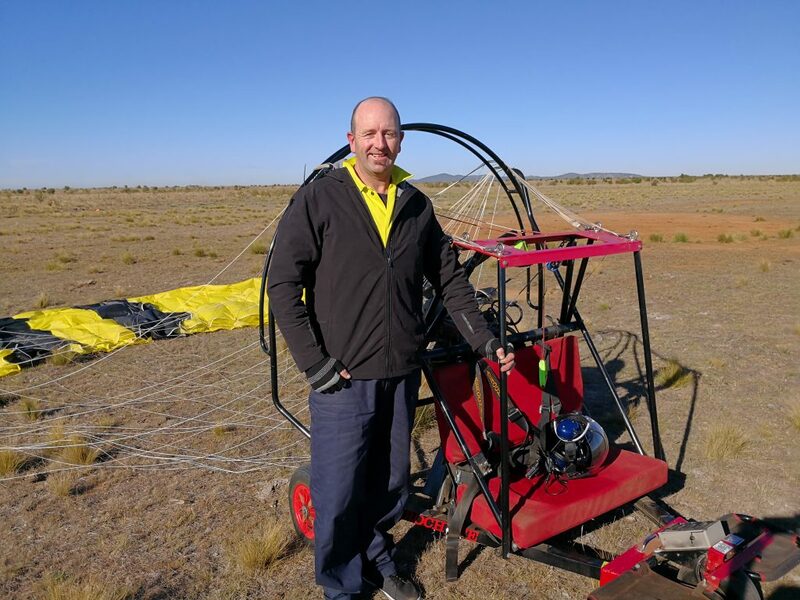 The trial flight was nothing short of amazing and exhilarating and Stephen showed us how easy it was to fly an Aerochute. We did some low level flying and many turns at Stephen’s training ground. As we were flying, Stephen said over the intercom “take the controls and turn left and then right. “Are you sure” I was thinking, knowing there were 2 sets of toggles so Stephen could control the Aerochute at the same time. “I thought this is fantastic”. As I pulled down on the left toggle, the Aerochute began to banked left. Then a pull on the right toggle and off to the right we would go. It was so easy to fly and the view we had all the way to the City of Melbourne left me wanting more. Then over the intercom as we were flying in circuit, “Were are going to do some touch and go’s” Stephen said. Touch and go’s are were you land and take off again. Stephen made the landing feel so smooth, I couldn’t believe it. Four years ago prior to this day, I had broken my back in 3 places and have 2 titanium pins supporting my L1 vertebrae. While my back feels 100% today,I did have a slight concern that the landing would be a little bumpy and maybe cause some aching in my back. However, not the case in the Aerochute. Stephen made the landings so soft that you could hardly tell you were back on the ground and then as the engine roars, you are off completing another touch and go. It was that moment despite the exhilaration and adrenaline pumping through me that this is what I wanted to do. After a few touch and go’s, thinking that was the end of the ride, Stephen said “you can do a touch and go now”. The feeling of nervousness and excitement with some adrenaline thrown in as well was overwhelming. I was actually flying this thing and it feels amazing. Under his expert tuition, I circled the runway and lined up for my first touch and go. With Stephen coaching me through every step, I still couldn’t believe I was flying. As we lined up the runway, concentration levels at the highest, ground rushing up at me, running through all the checks, then the instruction came over the radio to “flare the parachute” and the Hummerchute we were flying gently touched down. “full power” was the next command and we were off flying again. “Did I really just do that” I said over the intercom. “You sure did” said Stephen. Wow, I can’t believe it and it’s so hard to put into words the feeling of flying an Aerochute, you just have to experience it yourself to understand. With no cockpit in your way, the air blowing in your face, un-obstructed views and knowing you are flying in one of the safest aircrafts in the world, I was hooked. The introductory flight lasted about an hour in the air which in reality,only felt like 10 minutes, but it was time to land. After landing, the feeling of satisfaction and excitement was amazing. I was almost lost for words, which is unlike me. I shook Stephen’s hand and said “thanks so much for that, it was simply awesome”. The smile on both mine and Rick’s faces said it all. This was it, this was what we wanted to do. All the way home this was all we could talk about. For weeks after both Rick and I would call each other and talk about that day and how we need to enrol to do out pilots licence with Aerochute Industries. Whenever Rick and I got together, flying and Aerochute was the only topic of conversation. I’m sure our families were getting sick of it. Then it was decided. It was time to enrol and a visit to the Aerochute factory in Coburg, we were shown how the Aerochutes are designed and built. Stephen also explained the steps taken to obtain CASA certification on his Aerochutes. With all the boxes ticked, we decided to book in for the training course. This is finally real, this is really going to happen. I couldn’t sleep that night whenI got home due to the excitement. I became an overnight weather expert and I watched the weather forecast and waited in anticipation for Stephens phone call to say the weather was right and we will be flying this weekend. Then the phone call came and we were to be at the airfield at 6.30am Saturday morning to start training. That night I was like a little kid on Christmas eve. I couldn’t sleep due to the excitement. Next minute the alarm goes off and I jump out of bed and get ready. Off to the airfield to start my dream. Rick was already there are well, obviously as excited as me. Stephen showed us around and introduced us to James who is another flight instructor. We were showed how to do a safety checks over the aircraft and then a pilots brief on wind direction, runways, flight circuits, safety and basically how the day was going to run. We then warmed up the aircraft and moved out onto the run way to set up the Aerochute. After being taught all the correct procedures in setting up the Aerochure, both the machine and the canopy, it was time to climb aboard with our instructors. A check of our comms complete, checking the wind direction done, Runway clear, harness secure, “CLEAR PROP” was the next command and the Aerochute roared into life. A small amount of acceleration and the canopy began to fill with air from the prop. As we slowly crept forward and the canopy centred directly over head it was full power and up into the air we went. It was amazing how quick and easy the Aerochute can take off. Without boring you with all the details, both Rick and I spent the next several weekends flying beside an instructor leaning all the technical aspects and emergency procedures of flying an Aerochute. We had completed just over 5 hours flight time when Stephen said, “tomorrow we’ll do a dual flight check for solo”. That means if we pass and Stephen is satisfied we are competent, the next flight we will go up on our own. During the flight check, both Rick and I demonstrated the necessary skills to satisfy Stephen that we are ready to go solo. With the solo examination complete, Stephen said we are both ready. So the following weekend it was time to do our first solo flight. Being a little nervous, but knowing we are in good hands and constant radio communications with Stephen, the first solo flight was totally exhilarating. Whilst enjoying the scenery from the air, Stephen maintained constant radio contact from the ground and was observing us closely. Whilst flying over the training ground, a herd of kangaroo’s were moving south, hopping graciously along the ground, what a sight. Looking at the horizon I could see the coastline around the bay. Looking a little further east and there was the city skyline. Wow…what a view! Knowing that I am now flying by myself, whist still respecting the limitations and keeping constant vigilance on the task at hand, I realised, I have finally fulfilled my dream. Rick and I continued our training until we reached the required flight time and were granted our pilot licence to fly. With an Aerochute each on the trailer, pilot licence in hand we were ready to let the adventure begin! I just want to thank Stephen and James from Aerochute Industries for their professional tuition and for enabling me to finally live my lifelong dream. TEN kilometres to the west of Werribee lies a small airfield that’s home to an unusual aircraft. 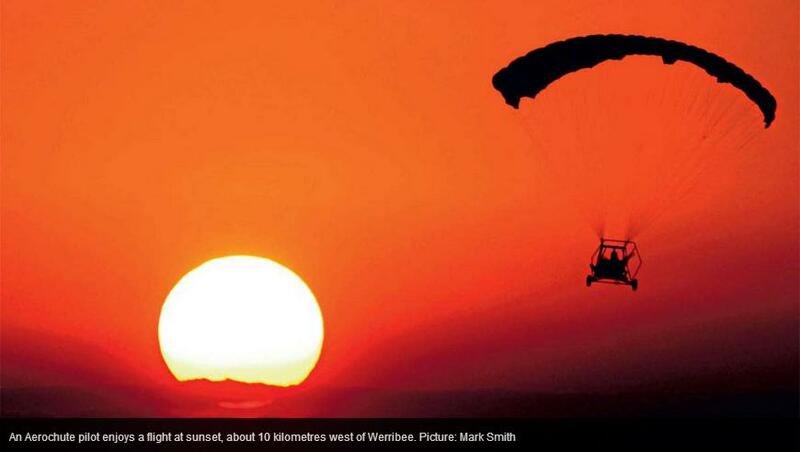 While a Jetstar Airbus flies overhead, inbound to Avalon, a small engine roars as a strange-looking cart with two people on board moves forward, attached to a large parachute that fills with air. Inside, pilot Steve Conte is introducing potential student Darryl Deller to the joys of flying an Aerochute. A short run along the bumpy runway and the cart, which looks ungainly on the ground, lifts off and heads skywards, suddenly gaining a smooth grace like a soaring bird. At the end of his half-hour flight, Deller agrees. “It’s fantastic. You get up there and have the wind in your face. You look down and realise there’s nothing between you and the ground except the seat you’re sitting on. Another potential student, Jodie Wood, of Bonbeach, was equally impressed with her Aerochute experience. “It was like being on a flying motorbike just above the ground. My favorite part was watching the kangaroos as we flew above them. It was dawn. It was cold. And Stephen Conte had to be kidding. I was in the middle of inspecting a hangar full of beautiful (and very airworthy) looking sailplanes when the sound of a loud two-stroke engine shattered the early morning tranquility. Outside the hangar sat a tricycle with the lanky frame of Aerochute manufacturer Stephen Conte hunkered down in its bench seat. Gliders may not have motor but at least they have wings. Conte’s craft didn’t appear to have a prayer of flying let alone any visible means of aerial support. All the trike had – lying in the dirt behind – was a huge, multi-colored rag attached by a tangle of cords. But then came a miracle. Conte cranked the two-stroke motor hanging off the back of the trike to full noise and the giant rag was transformed. First, the pusher prop blew it off the dirt. 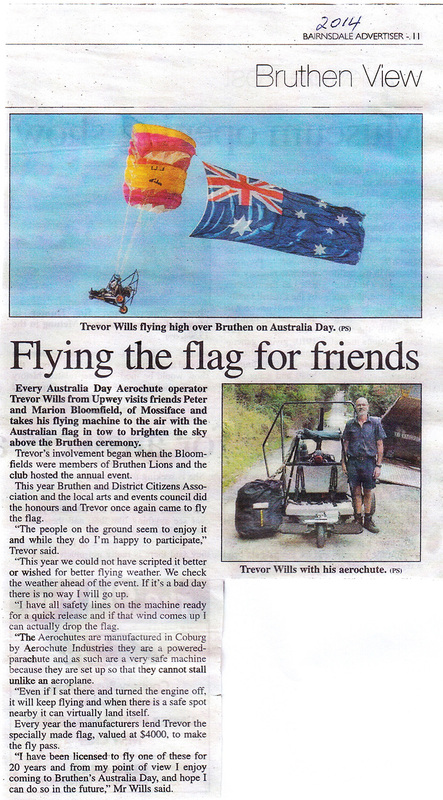 Then the trike rushed forward and a parachute swung up and blossomed above. One blink later and Conte was airborne, screeching into the distance like a lawnmower gone wrong. The whole process can’t have taken more than 15 seconds; it was like watching a parachute landing in reverse. A few circuits for the camera and Conte lands. My turn to fly. On goes a mandatory open face motorcycle helmet along with a thick pair of gloves in deference to the early morning freeze. I strap in next to Conte – accommodation for two is tight on the thin bench seat. Clear prop, zip start and we are off into the take off roll. Conte looks back and up to make sure we have a flyable wing, decides we don’t, chops the power and we roll to a halt. It’s my first aborted take off in any flying machine and I start to wonder whether the Aerochute is as safe as the promotional blurb makes out. The Aerochute design idea came from a Ministry of Defence specification calling for a durable, easily rigged and transportable machine that was simple enough to fly for the dumbest grunt with the worst hangover. It also had to be hard to crash. We get set for take off again. A heavy dew has wetted the nylon ‘chute causing deployment problems. But this time the wing swings up sweetly and, after a much longer roll than Conte’s one-up take off, the little ship gets off the deck. We climb to 150m and watch the world awake. All is serenely beautiful but my rational mind starts to wonder about the structural integrity of the four solitary D rings holding the ‘chute harness on (the karabiners are similar to those used in hang gliders and could probably secure the QEII). From there it wanders to the possibility of an errant propeller mowing through the lines – but they’re made of Spectre, which is strong enough to foul the prop before a line could possibly break. My gloomy reverie is broken by Conte screaming something through the two stroke din. I shrug my hands up to motion that I don’t understand and Conte responds by handing me the controls. Oh my God, I’ve got the ship. Fear turns from illusion to the real thing. Flying an Aerochute is bone simple. A foot throttle controls the climb and descent. Put the boot in and the Aerochute climbs; back off and it descends, and somewhere in the middle of the throttle travel it cruises level. Full tilt is 70km/h with a minimum airspeed of 40km/h. Aerochute flying controls consist of two steering toggles (or “brakes” in parachute talk), which hang down at shoulder height. Pull left to go left and right to go right. One foot goes on the throttle bar and the other can do what it likes. Conte has a hand throttle designed so that paraplegics can fly the craft. The Aerochute has to be one of the world’s most austere powered aircraft. The only contraption more minimal is a Para glider with an engine that straps to the pilot’s back. I grip the brakes as if they were Lotto cheques. “Turn left!” gets hollered in my ear and I give the left brake a half-inch tug. We keep sailing off to the right in the general direction of New Zealand “More!” and I give it another half inch. New Zealand remains the destination. A hand grabs my left wrist and reefs it down a good 12 inches. The ship responds smartly by swiveling left and heading for Brisbane. Aaah ha – a little bit of effort goes a long way in steering the thing. Bank in turns is gentle, even with the steering toggles pulled all the way to the stops. The ship will fly straight and level with hands off the brakes. Conte is managing director of Aerochute Industries, which distributes the machine throughout Australia and overseas. 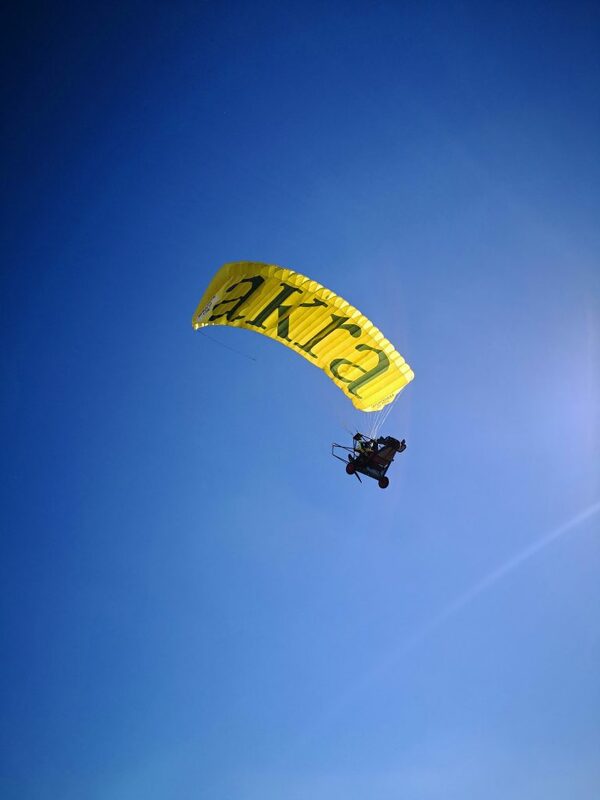 He sees the domestic market for the Aerochute split between sport flyers wanting to get into the air quickly, safely and cheaply, and farmers using the Aerochute like an aerial trail bike. The Aerochute machines have been sold worldwide, with the majority going to recreation flying and farmers for aerial survey work. Selling points are ease of use and safety. 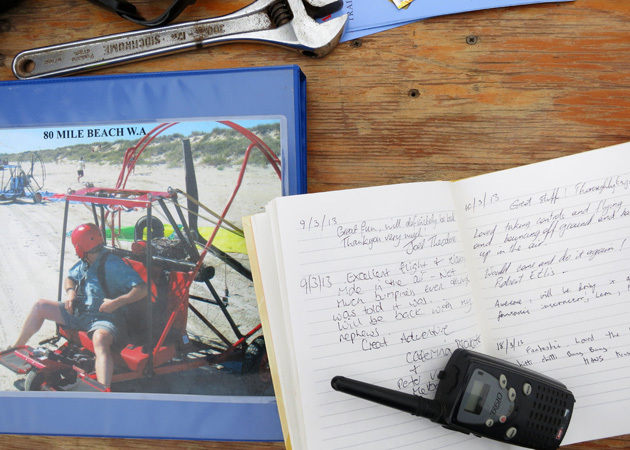 Australian regulations call for 20 hours instruction as per ultra-light pilots. 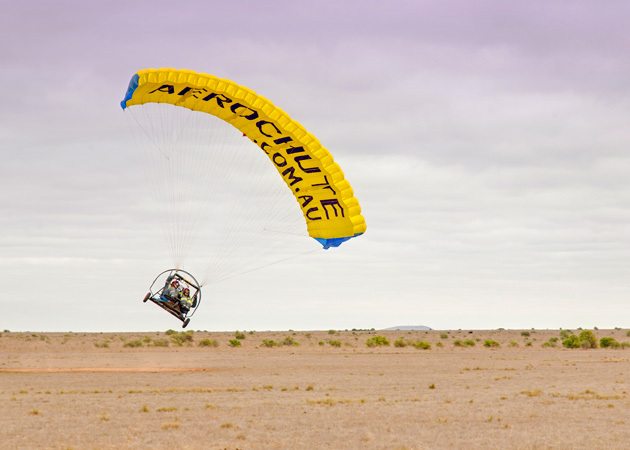 The Aerochute is certified under Air Navigation Order 95.32, which relates to powered parachutes and trike hang-gliders. Under ANO 95.32 the Aerochute can be flown to a maximum altitude of 1500m (true ceiling is 3050m) and can be flown cross-country so long as you stay out of controlled airspace. Gusty winds will keep an Aerochute pilot on the deck, as flying is not recommended in winds over 15 knots and the maximum allowed crosswind for landing is five knots. Conte says the most obvious safety feature is the wing; if something goes wrong then you have already bailed out under a good ‘chute. In more than 10,000 hours of operations world-wide there has yet to be a serious Aerochute crash. The aircraft is incapable of getting into a spin and stops in the brake lines make it impossible to stall the ram air wing. 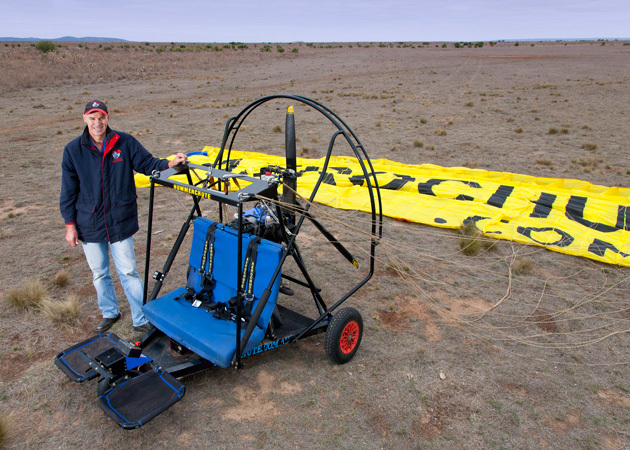 The machine has been flown 1500km across the Australian outback and has been tested for high altitude, high temperature performance in North East Africa. A variant equipped with skis and balloon tyres was flown around the Arctic for three months. We land. This is achieved by leveling out close to the ground, backing off the throttle, and pulling on both brakes. The increase in drag on the wing pitches the nose up and the craft touches down back wheels first. Braking during the landing roll is accomplished by extending a Reebok until the ship stops. My second flight is much more relaxed. This time I know the thing is a gentle flyer and I get involved with enjoying rather than worrying. The sensation of flying low and slow is fabulous: there is no cockpit to dampen the experience of being in the air and you can watch the countryside roll under in exquisite detail. The feeling is God-like. My grin has spread to the vicinity of my ears by the time Conte lands and I am hooked. As the ship rolls to a halt all I want to do is hand over the readies and make it mine !